This beheading takes a little scene-setting. I was sitting outside a little while ago, enjoying this deliciously mild April afternoon with a an obscene amount of whiskey, an even more obscenely endowed cigar and a fat French novel on the endless depradations of journalism when, between the yonder sounds of an ice cream truck’s Joplin-inspired call to sprinkly cones and the nearer jabbering of degenerate mockingbirds I heard Cheryl’s voice from the upstairs bedroom window throw me a siren’s greeting. From where I was sitting I couldn’t see her, so I walked a few steps into the yard to better fill her in on my vices and talk strategy about the next few hours: we have plans a few hours from now to perhaps drop in on the Ribfest in Town Center, where we both have intentions of Christening Palm Coast’s version of boozing us citizens for the greater benefit of the city then hop over to the galleries to check out Hollingsworth’s novel art and the Art League’s spring show. Then it happened: the death rattle. You’ve heard it. We’ve all heard it if we live south of the Mason-Dixon Line. It’s that rapid-fire rattle of the air-conditioner’s compressor blades committing hari-kari with the sound of an invisible AK-47. It immediately sends chills down your spine at the coming hassles—the heat rising in the house, the night’s mottled skin, the hunt for an air-conditioning repairman who doesn’t relish the weekend call as an excuse to gouge, the wait, the goddamn bill. Cheryl disappeared from the widow. Spousal flirt over. I walked over to the unit. We have two of them. It’s a two-level house. At least one of them was still humming, suggesting that all was not lost. I got nearer. Both of them were still humming. Both blades still spinning happily, unalarmed. No smoke. No strange smells, no more strange sounds. A few palm fronds surround the units. At first I thought one of them was caught in the blades and got its last rites. But they don’t hover that closely. That wasn’t it. I got nearer. 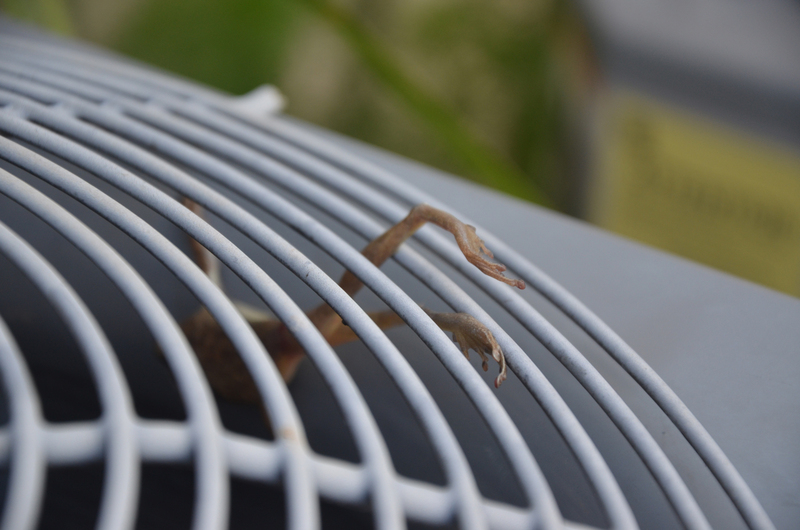 The arthritically crumpled hind leg of a miniature horror from the Jurassic was sticking out of the grille—a lizard, a frog, an iguana or who knows what. My ignorance, too, was showing its legs. The victim’s last sight and testament was attached to a body sinking inside the compressor’s sarcophagus, and disappearing in a frozen curve down the round side of the thing like a memory from a medieval dungeon. I know next to nothing about Floridian reptiles, so my next thought was itself testament not to the life just lost so much as to my ignorance, which assumed it was a lizard that, from the looks of it, had been cleanly decapitated, the death rattle having been nothing more (or nothing less, if you’re a relative of the poor creature) than the bony head of the bonehead making a tocsin of its murderer. From where I stood it looked like a clean beheading. No blood, not even time for the lizard to have a last slither. It was congealed in its last crawl on earth, mostly inside the compressor, that small bit of itself sticking out of the grille like a grave marker. I can’t describe my relief and joy. There would be no air-conditioning emergency today. Only a requiem. I announced the good-and-bad news to Cheryl, who had disappeared from the window faster than it takes to dial the local Palm Coast Heating & Air rep (they’ve been advertisers with us since the Cambrian era, might as well give them a plug). But it wasn’t over. There was still the matter of playing undertaker. I grabbed a few dozen yards of paper towels in preparation for the retrieval operation. Then I remembered what any homicide investigator worth his FHP would do: I asked my son to bring me the camera. I took a few shots, for the record, for the memory, for the potential litigation. You never know with lizards, who have an entire profession named after them. Cheryl wanted to have a look, and say a few words. The Bible, however, stayed upstairs. This would be a secular sanitation job. Then I set to work. And lo and behold, there is a god. Or at least a frog angel. For it wasn’t a lizard at all. (See above, under ignorance). As I grabbed the deceased from its leg and pulled it back into the world of the unbladed, the body, which may have been shuddering more than I was, was no lizard but, as Cheryl was quicker to notice, a frog. And it was not decapitated. It was all there. Head, torso, arthritic limbs, eyes as wide open as a scene from a Stanley Kubrick movie, though its snout bore a mark as clearly red as if it had just been consecrated with a bindi. Good thing the Bible was left upstairs: we were in Hindu-chakra territory. The frog had merely had the experience of going mano-a-mano with Mike Tyson reincarnated as a set of blades. The sound we’d heard was nothing Howard Cosell hadn’t described in a thousand metaphors from Manilla to Kinshasa, and now, from beyond the grave, from Palm Coast. The sun was shining on this frog-prince, and shaming my earlier assumptions of a beheading, though they’re not without an absolving explanation my shrink and PTSD medicine would understand: this is April 13 after all, a date that lives in every Lebanese-born descendant of that infamous memory. It was 38 years ago today (on a radiant Sunday) that the Lebanese Civil War began its 15-year folly of sectarian bloodletting, much of it by way of memory-rattling and un-neighborly beheadings. Every year on this date I either choose to neutralize the memory by writing about it or, as I had chosen to do today, inducing myself into a mildly oblivious coma with enough drink and smoke to make an Islamist’s beard turn white. It had been working. Until the death rattle. Oh well. I walked the stunned frog across the road, the frog’s eyes and mine locked in an embrace half grateful half resentful, and gently put the creature down by the woods of the empty lot. It would either be its almost-final resting place on the way to a fellow-creature’s feast, or its convalescent swale. Assuming, of course, that a Flagler County sheriff’s deputy with an itchy finger and a Glock didn’t drive by. Highly entertainng! Reminds me of Gerald Durrell’s early work. I feel your last sentence was inappropriate and uncalled for, our Deputies do a very good job and most of us citizens don’t really understand the methods or policies they have to go by. Your previous article is lacking in alot of information in regards to dealing with wild animals. There are other agencies that need to get on the ball with dealing with these sick/rabid animals but you just feel the need to take another jab at law enforcement. It’s apprent that some or readers are not fans of law enforcement and what they do but are quick to criticise them and no matter who it is or what they do will not be their liking. Good lord, it’s merely a Bombeckian piece, not a social outcry. Frankly, I’m offended that you’re offended. No wait, I’m not offended, I’m saddened by it. No, screw it– yes, I’m offended. Might as well throw in a good eye roll and a sneer of derision, because I did as I read this completely vapid response. I’m sure Ernest wouldn’t mind sharing his books title with such a good story, even if it is about a frog not a bull. The best part of this whole story is the last sentence!!! Absolutely BRILLIANT! Now I have to clean the coffee I spewed all over my laptop screen. Thank you for the laugh my friend! I feel the last sentence reflects the authors biased hatred toward law enforcement and that it should be stricken. You know these men and women have a hard enough time and then they are people like you that just make it harder. How would you like someone to bash every move you make in your profession. Maybe we should and make a different paper bashing Flaglerlive or at least having an unbiased opinion. Oh there is a paper with a unbiased opinion the ” News Journal”. glide and Tinman, in case you didn’t get it from the previous thousand words–surprising for Tinman, whose comment about the News-Journal reveals an acute sense of humor–the piece was written with tongue rabidly in cheek. Knowing our fine deputies, they too have a sense of humor, and would certainly not want to be mistaken for grim cops who can’t take a joke. If they are, we’re in more serious trouble than that poor frog. So a freaking lizard got chopped up. Try roasting those lizards and frog legs on the barbie. Go hunting, go kill something….Be a man !!!!!! Lighten UP, glide and Tinman. This was all in good humor, something we could all use a lot more of around here. That was a cute story until the slam on the sheriff. Lighten up man. Way to go PierreWinkle….Nothing like p*ssing off the local law. Your probably now on the local “terrorist” list of Palm Coast ! Good article Pierre. I enjoy your lighthearted commentaries as well as your news stories. It reminded me of the end of the movie of “Fargo”. OMG people…the last line, like the rest of the anecdote, was said in jest. I thoroughly appreciated the entire piece. Well written, dry humor. Bravo and kudos! We all croak one day or another. As a long-time A/C professional and wannabe writer, I’m glad to see I’m not the only one who does his best work drunk.